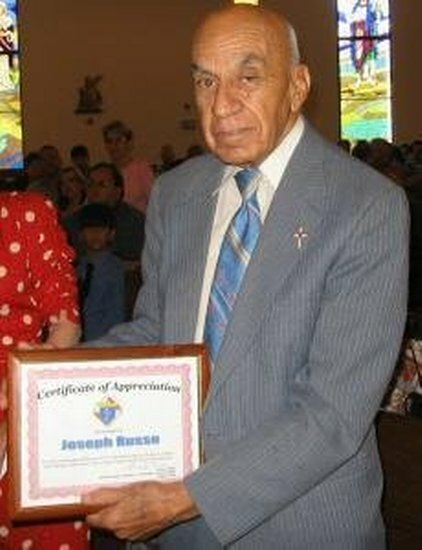 Mr. Joseph Anthony Russo was 88-years-old when he passed away on February 18, 2009. Known affectionately as "The Candy Man" or "Uncle Joe" or "Slim" to many St. Patrick parishioners, Mr. Russo was a World War II hero and a soldier in General George S. Patton's Army. He was part of the infamous D-Day invasion and earned the Purple Heart among many other honors relating to his military service. Mr. Russo became a member of St. Patrick Knights of Columbus Council 10567 on February 18, 1992 and made his Second and Third degrees on February 23, 1992. Mr. Russo was buried in Elmwood Cemetery. Editor's Note: We welcome any contributions to this page from any friends or family of our brother Knight Joseph Russo. If you were one of the many who celebrated the life of Mr. Russo and you have any comments or stories about Joe that you would like to share, please e-mail Louis J. Muro. We also welcome any photos of Joe that you might have. To send an e-mail to Mr. Muro to submit comments, click here to go directly to his contact page. "Uncle Joe" ("the candy man") made quite an impact on all of us! He was a fine man. Our kids always looked forward to his candy gifts (well, we all did!)! If I remember correctly, he also fought in the WW2 Normandy Invasion. A great man & a hero! He'll definitely be missed. They don't make em' like him, any more! No question about it...Jesus surely reserved a special place for Uncle Joe!" Note: This was published as a "Farewell" feature in The Birmingham News on Sunday, March 1, 2009, shortly after Mr. Russo's death. Joseph Anthony Russo, 88, went home on Feb. 18, joining his 12 siblings and parents, said Mary Lee Russo White, his great-niece and goddaughter. "He used to tell me, `Everybody in my family is at Elmwood except for me,'" she said. "I'm just glad he went home." Russo's parents moved from Sicily to the United States in 1900, settling in Birmingham, where they raised 13 children and owned a grocery store. He was the second from the youngest and close in age to some of his nieces and nephews, including White's father. White called him Uncle Joe Joe and considered him to be more like a father than an uncle. Her own father, Leo Anthony Russo, passed away when she was a child, she said. "I felt like he was my daddy," White said. "He was a wonderful man. He never met anybody he didn't embrace. He was always there for us. When my daddy died at 31, he walked me to the casket to see my daddy. And when my mother died six years ago, he walked me to see my mother." Russo, a World War II veteran, retired from the railroad and never married, White said. He was engaged when he was younger but his fiancee was paralyzed in a car crash and later died, she said. "He would wheel her around in the wheelchair. He was with her when she died," White said. "He always kept her picture with him. All my life I remember seeing that picture at his house. He never wanted to marry again." Before Russo died, White asked him to tell her the story of his life. He told her about being in the third wave of the Battle of Normandy. He served under Gen. George Patton and was injured by shrapnel in the Battle of the Bulge, White said. "He was in the Army hospital over there," she said. "He was there when Patton was in the jeep wreck and went to see him three times while Patton was in the same hospital." White remembers seeing all of her great-uncle's medals as a child. He said he was most proud of a medal for good conduct, she said. Russo was born and raised in Birmingham, where he was known later in his life as the Candy Man for bringing large amounts of candy to children on Halloween, White said. He loved baseball and coached youth sports. A devoted Catholic, Russo was involved in the Knights of Columbus, she said. "My daddy used to call him a prince of a man," White said. "And he was. He was a prince of a man."